The title of yesterday’s episode, “A Totally Fun Thing That Bart Will Never Do Again”, is a reference to a famous 1996 David Foster Wallace article for Harper’s, in which he embarked on a giant luxury liner to experience the narrow, selfish, and vapid thinking that underlies the modern cruise industry (as well as the bland and mostly uninteresting people who think of it as the height of fun). It’s an enjoyably cruel piece of writing (it was later used as the headline piece to a book length collection of essays he published), and you can read the whole thing in PDF format. The subtitle is “On the (nearly lethal) comforts of a luxury cruise”, and the main point is that cruise vacations are mercilessly inhuman. Wallace held the cruise industry in utter contempt, and not without cause. It’s environmentally disastrous, ethically compromised, and generally unpleasant on anything deeper than a surface level. The spectacular sinking of the Costa Concordia in January is only the most high profile of the industry’s problems. Two years ago, they kept sending tourists to their fenced in resorts in Haiti while people were dying in earthquake rubble. Crew members, who work long and extremely stressful hours, routinely disappear without a trace. And just a few weeks ago, two fishermen died on their disabled boat when a cruise ship failed to rescue them even though the crew had been alerted by passengers to their presence. In other words, this is an industry that places a higher priority on cheesy lounge acts and shuffleboard than it does on human life, and it is ripe for parody and satire. David Foster Wallace knew that the only way you could say something honest or interesting about cruise ships was by reveling in the ugliness that props up that gleaming facade of stark white hulls and perpetually happy people. Zombie Simpsons borrowed his title, and then did the opposite, making their cruise out to be so awesome and perfect that they actually wrote a song about how awesome and perfect it is. I realize it’s not their job to do exposes on irresponsible corporate behavior, but by sticking with such a sunny perspective they limited themselves to only the safest and most tame kinds of comedy (when they were bothering to attempt humor at all). Lisa: It’s so diverse! I’ve died and gone to a PBS kids show. Marge: You’ll never guess how many bath towels they gave us. Enough! Bart: And there’s a DVD library of movies that haven’t been released yet! Whoa. Whoa. The episode wasn’t completely without its charms, “Magazine Hater” magazine is pretty clever, and the cult of the lifeguard isn’t a terrible idea. But, again and as usual, the stuff that has a little bit of thought to it is drowned in a sea of garbage that can’t rise to the level of being semi-clever or even coherent. When this is your ending . . .
. . . the ship has irreversibly foundered. Anyway, the numbers are in and they continue to be historically bad. Only 5.00 million viewers sat through last night’s infomercial for Carnival and company before hitting up the buffet. 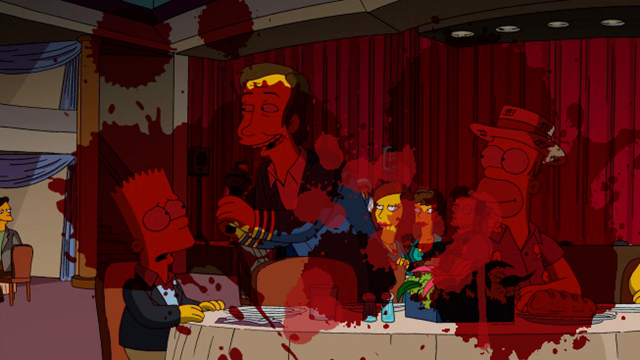 That ties last year’s “The Great Simpsina” for the fourth lowest number ever. The post-New Year’s episodes of Season 22 generally hovered around six million viewers. Season 23 is down to five million, and routinely fails to get even that many. In this mouth-full of a title-d episode, when Bart sees a commercial for the ultimate cruise, he begs his parents for a family vacation. Low on cash, the only way they can go is if each family member sells one valuable. 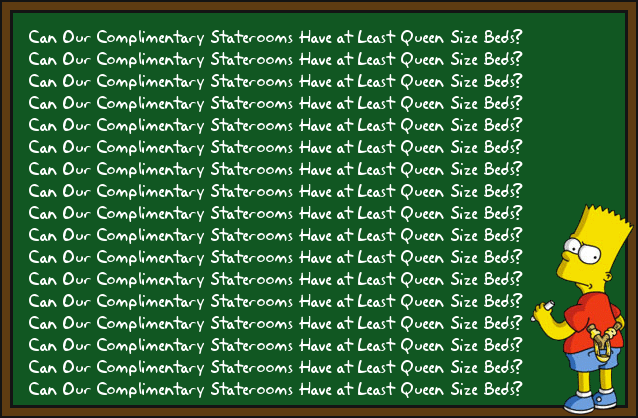 Once they’re away, Bart is determined to make the vacation last forever. So he comes up with a plan to make sure they never have to return home. I anticipate a well plotted piece of non-claptrap that never makes me want to wretch. 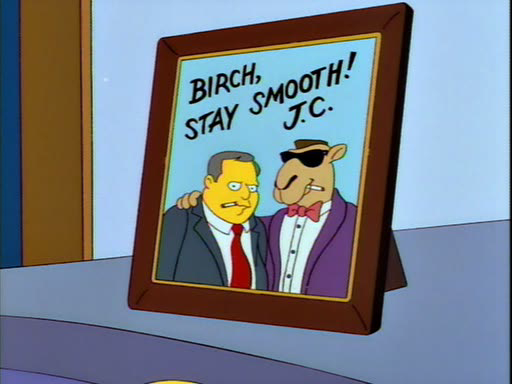 Quite a few people took to their keyboards this week, producing thoughtful and well written tracts about various topics from Poochie to “Bart the Genius” and the slippery nature of hero worship. On top of that, we’ve got lots of usage, an old story from Sam Simon, a couple of fan made drawings, two links to upcoming crappy merchandise, and a solicitation for people who can do Marge and Lisa impressions. Exclusive: "Simpsons" Co-Creator Sam Simon On The Show’s History With Gambling In "All In: The Poker Movie" – Smooth Charlie’s Link of the Week is this clip from a new poker documentary. It’s part of an interview with Simon where he talks about how real sports handicappers complimented him on “Lisa the Greek” as a show that, unlike the rest of teevee, was credibly written by degenerate gamblers. Apparently, at some special screening, they used to change the voices for whichever teams were in the Super Bowl that year. Lisa was right three straight years before they stopped. Woolly Mammoth Theatre Company Presents MR. BURNS, A POST-ELECTRIC PLAY, 5/28-7/1 – That play about people recreating society through The Simpsons after the apocalypse is finally premiering in Washington, D.C. at the end of May. It runs through July. ‘Itchy and Scratchy and Poochie:’ Totally in your face – An appreciation of Poochie. Homer: That Timmy is a real hero! Homer: Well, he fell down a well, and… he can’t get out. 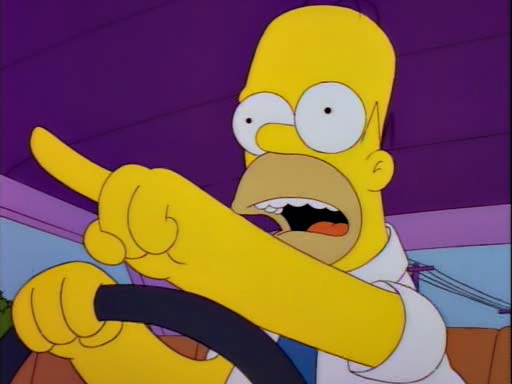 Homer: Well, that’s more than you did! Branson, Missouri, once described by Homer Simpson as being like "Las Vegas if it were run by Ned Flanders" is actually getting an injection of genuine Vegas glitz. No, not the Spearmint Rhino — it’s Branson, remember — the Las Vegas stage version of "The Price Is Right Live" will open in Branson this July. Bart recounts Homer’s description as “My Dad says it’s like Vegas, if it were run by Ned Flanders.” More importantly, there’s a stage version of “The Price Is Right”? Heaven help us. HOMER SIMPSON CANVAS PAINTING – Live in Queensland, Australia? This cool fan made Homer painting can be yours for only $30. I like the drool and the hammock, but since when does Homer read books? Angry Birds Space adds ten levels – Simpsons could be next – Oh good, another tie in. Former producer speaks of his humble beginnings – Simpsons alum Joseph Boucher gave a talk at Cal State Fullerton. Not much fresh information here, but plenty of encouragement for anyone wanting to get into animation. Simpsons – McBain, These are Loafers – I’ve always liked the way Wolfcastle just bends straight over and stares right at his shoes. I have a fairly short list of ‘favourite things’. “Simpsons + Baseball”? I’m intrigued. I’ve always wanted to try playing a real a Simpsons rules softball game, but where would you find a park that would let you set up a keg at first base? NFL.com news: Five takeaways from Seahawks’ pre-draft presser – The Seahawks GM apparently lapsed into a Homer impression during a press conference. Sadly, no video. I was living in Canada during those years, the ’90s, and I remember having this English teacher who, as far as I could tell, didn’t really teach us much, but would stand at her podium, lecturing us about the ills of the world. She would fill us in on the details of the war in Kosovo, denounce America as a nation of gun-toting buffoons, and–frequently–get into a tizzy about how awful The Simpsons was. “Completely inappropriate for children,” “racist,” and sexist” were a few of the charges she levied against the show–and, in her criticism, she wasn’t too far removed from the show’s detractors in authoritarian China and Venezuela, and its critics in the United States, a country that she hated so much (I’m sure the writers of The Simpsons would have found a delicious irony in this). At the time, I reasoned that if someone like that–my teacher–hated the show so much, then it must be even better than I realized. My teachers hated The Simpsons, which, of course, just made us love it all the more. Ah, memories. Fox’s 25th Anniversary Special…In 10 Words – And we can’t watch FOX because they own those chemical weapons plants in Syria. Happy National Pretzel Day; AKA A Dark Day For Baseball – YouTube of exactly what you think it is. #16: Margetini – A fan made sketch of Marge as a martini. That’s all well and good, but what’s in it? Simpsons Sums Up: The Vampire Diaries – Again, I’m taking Lenny’s word for this, but that guy on the bottom is smashingly handsome. If you’ve seen the episode, you’ll recall Homer Simpson’s devastation as he pulls from under a bed not the last peanut he was searching for – ”overflowing with the oil and salt of its departed brothers” – but a $20 bill. Until, that is, he remembers ”money can be exchanged for goods and services”, so $20 can buy many peanuts. Doctor Robotnik Meets His Match, Sort Of – I chuckled. Seeking VO artists or impressionists who can do a great Lisa and/or Marge Simpson impression. We need a small number of lines recorded in their likeness for a proposal project. Good luck, those are not easily duplicated voices. HAHA ! I WIN! 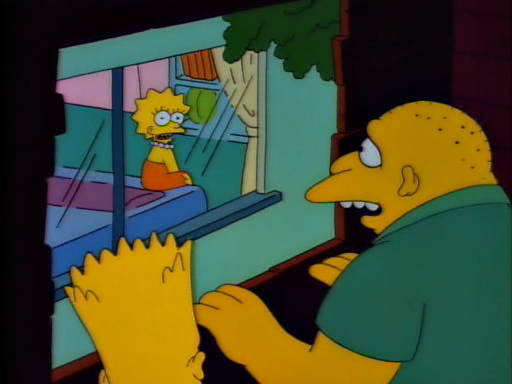 – Animated .gif of Homer taunting Marge with her own affection from “Lisa’s Pony”. It Happened to YOUUUUUU – A Radiohead infused illustration of Grampa’s “It’ll happen to you” quote. Which MBTI type are the characters from The Simpsons? – A Myers-Briggs list of Simpsons characters. 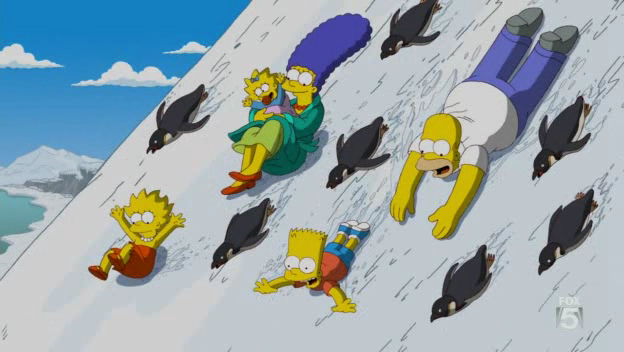 Simpsons – Homer ‘Whoop whoop whoop’ walk (gif) – Just what it says it is. Throughout the film, there are several instances of brilliant philosophical dialogue. The most important of these, insofar as it sets a framework for the film and, simultaneously, reflects on Bresson’s aesthetic tendencies, is the conversation between Jacques (Guilliaume des Forets) and his artist friend. They speak about what I — and several distinguished writers, including Noel Carroll — now consider a fundamental truth in the appreciation of artwork: what matters isn’t what is there, but what isn’t. For example, with a painting, art arises from the spaces between the lines — what is not shown — rather than what is physically evident. Even the Simpsons understood this. In an episode I cannot quite recall, Lisa tells Bart to listen to the notes “they are not playing”. In just the same way, it’s the space that is created that instills art. How Working in a Warehouse Feels While Using an MP3 Player – Animated .gif of The Anvil. The Forbes Fictional 15 – It’s that time of year again. Bereft of any decent ideas, Forbes has once again made up a list of the richest fictional characters. This year Burns comes in at #13. “bring a whole lot of pleasure to Halloween and dress up parties everywhere”? Jebus. Snapshot: Juan Mata Buys David Luiz ‘Sideshow Bob’ Birthday Cake – Pretty much what it says. I’m impressed that they got Bob’s hair like that. Omer Counting in the Digital Age – Modern technology, The Simpsons, and homophonic pronunciation come together to help Jews count the days after Passover. It’s not hammered in by the plot really, but watching this again I was a bit depressed by the implication that a ten year old boy is fully aware that his father’s love for him is totally conditional. Even more depressing is that Bart is absolutely correct. Once he inevitably confesses out of guilt driven how Homer has been doting over him, Homer curses him and chases him through the house, causing Lisa to grimly comment to Marge that things really are back to normal. Who knew that the “reset the status quo” nature of the sitcom could be used to put a bit of tragedy into the proceedings? That was one of the things that was so great about the show. Their status quo sucked. 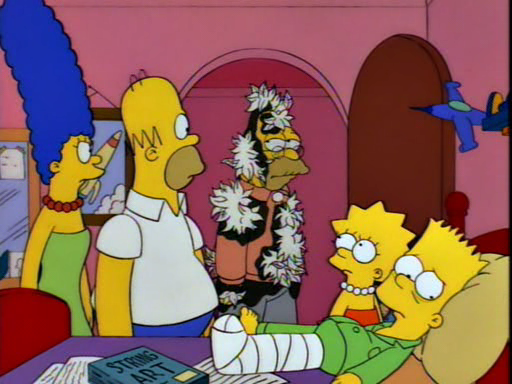 Naturally, that essential misery is almost totally lacking from Zombie Simpsons.